WASHINGTON -- For years, Fox News host Bill O'Reilly has been trying to save Christmas from all the pinheads who want to destroy the country by wishing people "Happy holidays." He has called the greeting "insulting to Christian America" and bemoaned the "'Happy holidays' syndrome." However, Crooks and Liars noted that later in his show, O'Reilly nevertheless said he had successfully saved Christmas for all God-fearing Americans. "Nine years ago when we started this reportage on Christmas, there were orders given by some major corporations in America to their employees, forbidding them -- forbidding them -- from saying 'Merry Christmas.' We outed those companies, they reversed the policy, so today, everybody as far as we know ... can say Merry Christmas to anyone they want," said O'Reilly. "It isn't a mythical war on Christmas. It's real, and we just won," he added. O'Reilly might not be willing to declare war on his employer just yet. Lately he's been saying that he actually doesn't really have a problem with people wishing each other "Happy holidays"; he just wants to make sure people don't have to say it. This month, he told former vice presidential candidate Sarah Palin, "I don't care about 'Happy holidays.' Somebody says 'Happy holidays' to me, I say, 'OK, give me a present.'" 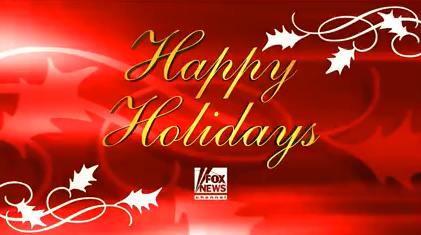 In the past, O'Reilly has falsely accused businesses of banning the greeting of "Merry Christmas."